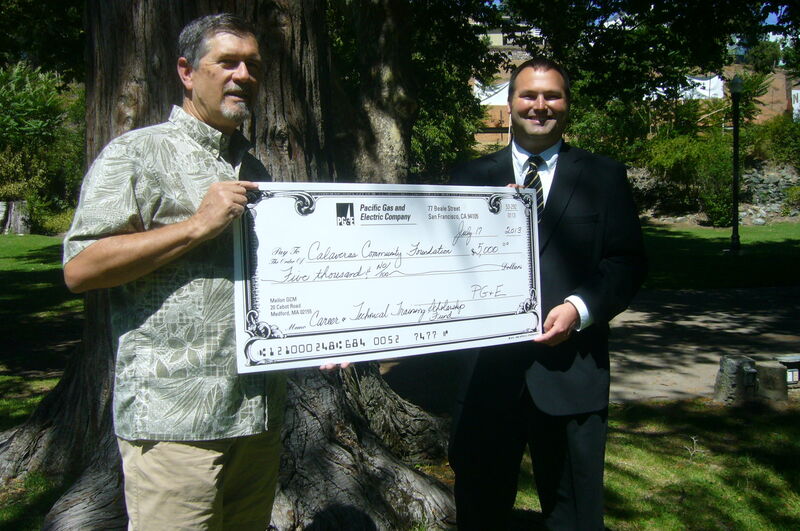 Pacific Gas & Electric Company (PG&E) recently presented Calaveras Community Foundation (CCF) with a generous $5000 donation to benefit The Career and Technical Training (C&TT) Scholarship Fund. The Career and Technical Training Scholarship Fund, founded in 2010, helps to support alternative forms of higher education, including two-year junior college and trade school certificates. In a September 1st article from Parade magazine, it was stated that the vast manufacturing assembly operations of the past have given way to high-tech, precision manufacturing where sophisticated components like aircraft parts, medical devices and lab testing equipment are the rule not the exception. The challenge in America is to produce more workers who have these skills. Near the end of last school year, C&TT scholarships of $1200 each were presented to eight local high-school applicants – these funds originating from CCF’s business and corporate donors like PG&E. Students from both Calaveras High School and Bret Harte High School were recognized as well as a young man being home-schooled. Anticipated fields of study include court reporting, heavy equipment, mechanics, electrical lineman, diagnostic imaging, agricultural and more. Our Competitive Grants and Scholarships benefit the residents of Calaveras County. The results we seek are not measured in purely financial terms. We seek a better community and a better future. CLICK HERE to see how CCF has improved lives. Since 2000, CCF has helped Calaveras County students pursue their dreams and has supported a wide range of projects improving the quality of life throughout our County. Building on this experience, the Foundation has begun a new effort to focus its fundraising and financial support in three very worthy areas. The Board has launched these initiatives for 2019 — Click to view initiatives. Together we can build a vibrant community of immeasurable and lasting value. Contact the Foundation for additional information on how you can create your legacy in Calaveras County or CLICK HERE to find out more about the ways you can give. CLICK HERE to find out latest news from CCF and what events are upcoming! and dedicated to providing financial assistance to charitable causes to improve and enrich the lives of Calaveras County residents. The IRS Form 990 Informational Returns for CCF are available upon request, or visit Guidestar.